With lush tropical gardens, Chic Hotel Montecristi is only a 5-minute drive from the beach and offers free Wi-Fi and an on-site restaurant. This hotel is located in the city centre. The modern air-conditioned rooms at this centrally located hotel come with a cable TV and a private bathroom with a shower and toilet. They also feature city views. The hotel’s restaurant serves local cuisine, including fresh seafood, and guests can find a variety of restaurants located within 2 km. The hotel also features a bar and ice-cream shop. El Morro de Montecristi mountain is a 5-minute drive from Chic Hotel, and there is an art museum only 500 metres away. The property features an on-site children’s playground, and the tour desk can help guests arrange activities like fishing, snorkelling and diving. Santiago International Airport is a 1.5-hour drive from the property. Offering free WiFi and free parking, Mission Dorcas House is a quiet, spacious and peaceful missionary home located within a few blocks of Montecristi's town centre. The property donates all proceeds to the Hope of a Child orphanage. Each room here will provide you with a patio. Extras include bed linen. At Mission Dorcas House you will find free shuttle service, a 24-hour front desk and a garden. Other facilities offered at the property include meeting facilities, a tour desk and a children's playground. An array of activities can be enjoyed on site or in the surroundings, including cycling. The hostel is 41 km from Cayo Arena. Offering free WiFi and an outdoor pool, Aparta-Hotel Cayo arena is located in San Fernando de Monte Cristi, 43 km from Cayo Arena. Free private parking is available on site. All units include a seating area. Some units feature a balcony and/or patio with sea or mountain views. There is also a kitchen, equipped with an oven. A toaster and fridge are also featured, as well as a coffee machine. Each unit is fitted with a private bathroom with a bath and free toiletries. Towels are available. Car hire is available at the property and the area is popular for snorkelling and diving. Guests can enjoy various activities in the surroundings, including cycling, fishing and hiking. This beachfront Monte Cristi Hotel Marina del Mar Inn features an on-site restaurant and rooms with free WiFi. The Mina de Sal is 4 km away. A cable TV, fan, and en suite with a shower are provided in each room at Hotel Marina del Mar Inn. Extras include air conditioning, towels, and linen. A garden and a terrace are a few places were guests can relax on site. The 24-reception can also make fishing, dining, and snorkelling sightseeing suggestions. Osvaldo Virgil National Airport is 3.2 km away. The hotel is also 6 minutes’ drive from Monte Cristi city centre and 3.4 km from Interstate 1. All rustic, hut-style units include a flat-screen satellite TV and air conditioning. Montecristi Hotel El Cayito Beach Resort extras include an en suite, free toiletries, and room service for a fee. Free transfer is provided from San Fernando de Montecristi bus station. A sauna, tour desk, and gift shop are on site. Transfer service to Santiago de Los Caballeros is offered for a fee. Guests at Restaurante Cayito can enjoy a sea view while noshing on typical local fare with fresh fruit and seafood. Bohio Lounge bar and café offers breakfast, lunch, and dinner with a view of El Morro. The hotel is 43.2 km from Cayo Arena. Monte Cristi National Park is 15 minutes’ drive from Hotel El Cayito Beach Resort Montecristi. The rooms here will provide you with air conditioning and the private bathrooms also come with a shower. You can enjoy a sea view from all the rooms. Some units have a balcony. The property offers free parking. El Morro Beach can be reached in a 5-minute drive, while there is a general supplies store 3 km away. Monte Cristi town centre is 2.9 km away. 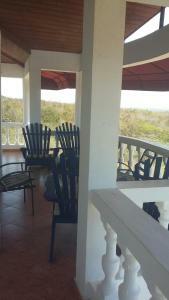 Montecristi House El Morro is a holiday home set in San Fernando de Monte Cristi, 42 km from Cayo Arena. You can fire up the barbecue for a tasty meal and enjoy the garden in fair weather. Free WiFi is provided throughout the property. Car hire is available at the property and the area is popular for windsurfing and diving. An array of activities are offered in the area, such as cycling and fishing. Situated on the edge of Monte Cristi National Park, El Morro Eco Adventure Hotel offers an outdoor pool and stylish rooms with garden views. Lo Italiano Beach is 300 metres away. Rooms at the El Morro Eco Adventure Hotel feature minimalist décor, air conditioning and free Wi-Fi. Each room includes flat-screen cable TV, a telephone and a modern en suite bathroom with a shower. El Morro Eco Adventure Hotel has 2 restaurants and a spacious lounge bar. There is also a tour desk, where you can arrange boat trips and outdoor activities, including kayaking, snorkelling, mountain biking and hiking. Free private parking is available at the hotel. It is just a 5-minute drive to the town of Monte Cristi and Osvaldo Virgil Domestic Airport. Puerto Plata is a 2-hour drive away. Offering a restaurant, cocktail bar and a private area in Buen Hombre Beach, Buen Hombre Kite Hotel is located in La Costa de Buen Hombre Bay. Free WiFi access is available in all areas. Each wooden bungalow here will provide you with a balcony with hammocks overlooking the beach. The private bathrooms come with a bath or shower. Extras include an outdoor seating area and a fan. At Buen Hombre Kite Hotel you will find a terrace, a bar and a snack bar. Other facilities offered at the property include a shared lounge, a games room and a tour desk. An array of activities can be enjoyed on site or in the surroundings, including kitesurfing, windsurfing, snorkelling, fishing, boat trips to Paradise Island in Cayo Arena and other beaches. The property offers free parking. Aeropuerto Internacional Gregorio Luperon Airport is 144 km away. Hotel Buen Hombre is located on the unspoilt Playa Buen Hombre Beach, a popular kite-surfing spot. It offers a bar-restaurant, watersports facilities and free WiFi. Rooms at Hotel Buen Hombre feature functional décor and a ceiling fan. Each room has a private bathroom with a bath or shower and free toiletries. Hotel Buen Hombre’s restaurant serves Dominican cuisine, while the bar offers a range of local drinks. The property also offers a terrace and free on-site parking. An array of activities can be enjoyed in the surroundings, including fishing and kitesurfing. The Hotel can arrange trips dto Cay Areana and Paradise Island from the hotel. Monte Cristi National Park is a 45-minute drive away, while Gregorio Luperon International Airport is 2 hours and 45 minutes’ drive away.